my cycling challenges.... : Day 15 : York YHA to High Melton, 51 miles on a very wet day! Day 15 : York YHA to High Melton, 51 miles on a very wet day! There is a risk that I could feel a little sorry for myself but I do seem to have been a little unlucky with the weather of late. However, that is not to say that I haven;t been lucky in other ways. Today's ride, although very wet (did I mention that yet! ), was fantastic and I really enjoyed it. That was partly because the issue with the back axle has now entirely gone away. I have to thank the guys from Cyclestreet bike shop (Dawes dealer) in York and I now have a new wheel on the back, the previous one had had a good run, the ride is as good as new. They dropped everything, and despite a hearing of a fatality of someone they knew overnight, they both were extremely helpful and did what was necessary to get me moving again. More of the country needs businesses like this. The next door deli is also fantastic and I had a couple of very exciting sandwiches later in the day that I bought there. I also learnt that the faster time for Land's End to John O'Groats is less than 2 days and that the guy on the left in the photo below (done the trip twice) completed one of his runs in 7 days including a 180 mile day!! I still think the Dean of Rochester at 12 days was fairly good going. You won't be reading about me complaining about any long days for me in future. York is clearly one of those cities that takes its cycling very seriously. The road markings and cycle routes are brilliant all over the place - although I was told that bicycle theft is on the increase. A really great place that I must get Jane to take me back to. Route 62 to Selby follows an old railway line and has been a traffic-free route for the last 25 years. The Abbey was apparently founded when Benedict saw three swans on a lake in Selby, and he saw it as a sign of the Father, Son, and Holy Ghost. This is why the official crest of Selby Abbey is three swans. One of a number of locks along the route - not many boats using the canal today though! Riding along side the Selby Canal makes short work of the distance from the cooling towers of Drax to those of power stations closer to Doncaster. There were plenty of people out working in the rain today from the people clearing the vital land drainage ditches near Selby to the manually operated level crossings closer to Doncaster. In fact I am not sure I have ever seen so many level crossings in a stretch of 2-3 miles before - from Ouston Wood to Bentley; some automated, some operated manually by others and one I had to open and close all the gates myself. I stayed at Doncaster College's Conference Centre - the Stables at High Melton - that has rooms for hire when not used for other purposes. Jane found it for me and at £30 including breakfast is great value although I couldn't eat last night as there is nothing within walking distance I am looking forward to a big breakfast in the morning. 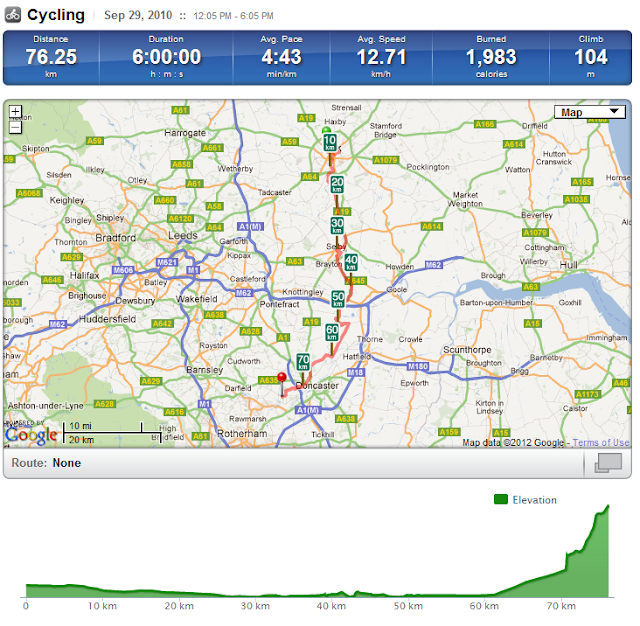 looks like a great route to try out - it's in my plans for 2011!